Recent trends in computing environments indicate that the future infrastructure for visual analytics will be distributed and collaborative. Collaborative frameworks create value for scientists, analysts, industrial partners, domain experts, and other end-users to meet, communicate, interact with others, and coordinate their activities in a globally shared network. This paper focuses on collaborative framework design for immersive analytics facilitating the integration of multimodal immersive interfaces. 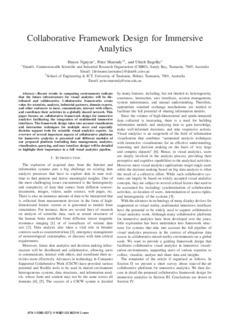 The framework design takes into account visualisation and interaction techniques for multiple users and especially decision support tools for scientific visual analytics experts. An overview of several important aspects of collaborative platforms for immersive analytics is presented and different modules of our proposed platform (including data management, analytics, visualisation, querying, and user interface design) will be detailed to highlight their importance in a full visual analytics pipeline.